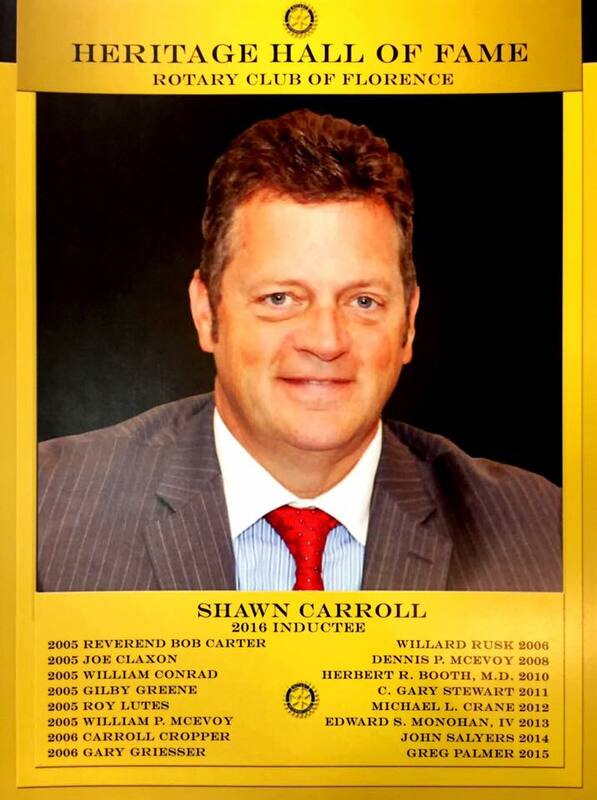 Shawn Carroll has been named to the Florence Rotary Club Heritage Hall of Fame. Carroll, executive director of New Perceptions in Edgewood, is a native of Boone County who is well-known for his involvement in church activities, charitable events and youth sports. “He is a man of faith, a man of integrity and a man of service,” noted Shea Carroll, during the tribute to his father at the induction ceremony on Monday, June 13. The Heritage Hall of Fame honors Florence Rotary members who exemplify the civic organization’s motto, “Service Above Self.” He joined the Florence Rotary Club in 1992 and was selected as president for 1995-96. He since has served as sergeant at arms and resident wit for many years. Carroll also organizes and directs the Rotary Club Golf Outing, which has raised more than $100,000 for college scholarships for graduates of Boone County high school graduates during his 19 years as chairperson. A graduate of Boone County High School and Thomas More College, Carroll has devoted his professional career to working with individuals with disabilities. He spent six years at Children’s Psychiatric Hospital in Covington, assisting children diagnosed with behavioral disorders. He served as director of Human Resources for Comprehensive Care Centers of the organization now known as NorthKey for 19 years before accepting the leadership position at New Perceptions. Carroll credited his parents with instilling in him a commitment to service. He said his father worked three jobs to support a large family, but taught him at an early age to volunteer and help people who were needier. Caroll’s investment includes two terms on the Boone County Board of Education and two tenures as chairperson. He is a longtime volunteer for the Bean Bash, which raises funds for BAWAC, New Perceptions, Redwood and Special Olympics. He also has been involved with Boone County Knothole Baseball, Boone County Youth Soccer and Boone County Youth Basketball. Carroll and his wife, Liesa, have been married for 32 years. They have two sons, Shea and Brennan. The Carrolls are members of St. Paul’s Church in Florence, where Shawn is a lay minister.